Si-Shell Review 2019: Is Si-Shell a Good Hosting? Si-Shell is a leading web hosting company ranked among the top ten largest web hosting vendors in Slovenia by market share. Established in 2006, this hosting firm has grown its customer base over time to more than 3,700. It offers comprehensive solutions that include shared web hosting, VPS, and reseller hosting. Si-Shell is a Slovenia-based web hosting vendor with a team of experienced IT professionals offering reliable and affordable services. Founded in 2006, this vendor has grown exponentially during the decade. Indeed, it is currently ranked among the top ten largest web hosting firms in Slovenia. Si-Shell offers shared hosting, reseller hosting, dedicated server, and VPS solutions. Its own website is available only in Slovenian. For guaranteed performance, Si-Shell uses modern HP servers located in data centers in Ljubljana (Slovenia) and Frankfurt (Germany). Designed to handle even the most demanding users, these servers are connected to a 100 Mbit connection and benefit from fast and reliable HP SAS disks with RAID 10. Also, all servers are equipped with DDR3 memory and 4-, 6-, or 8-core processors. The web hosting solutions offer unlimited data transfer and come in four packages that you can customize as you wish. You get a selection of three control panels – cPanel, DirectAdmin, or Plesk – that make it easy to manage your website. Si-Shell also offers four feature-packed reseller hosting plans that include features such as unlimited website users, 25+ domains, and up to 60GB disk space. I found this provider’s customized hosting solutions most appealing. Si-Shell can create tailor-made hosting plans based on your specifications, and you can choose (among other things) the number of domains and subdomains, disk space, database, and support. Backup services include six daily backups on Si-Shell’s servers so that your data is secure in case of a data loss event. SSL certificates by Geotrust are also provided. Si-Shell’s hosting plans have quite pocket-friendly prices, and you get the DirectAdmin control panel for free with every plan. Si-Shell also promises to transfer your website to its servers for free. Plans are billed on a monthly basis, but you can get a 20% discount by committing for two years. If you’re afraid of such a significant commitment, I can tell you that the 15-day money-back guarantee gives you a refund if you are dissatisfied with the services. Although there is no uptime guarantee, most customers are pleased with this provider’s efforts to keep their websites running with minimal downtime. Si-Shell’s technical support team is available 24/7, even during weekends and holidays. Customers can reach out to them by email, telephone, or ticketing system, but there is no live chat. There is also no knowledge base for you to support yourself. Si-Shell has invested substantially in hosting infrastructure and expertise to provide Slovenian businesses with reliable and robust hosting solutions. 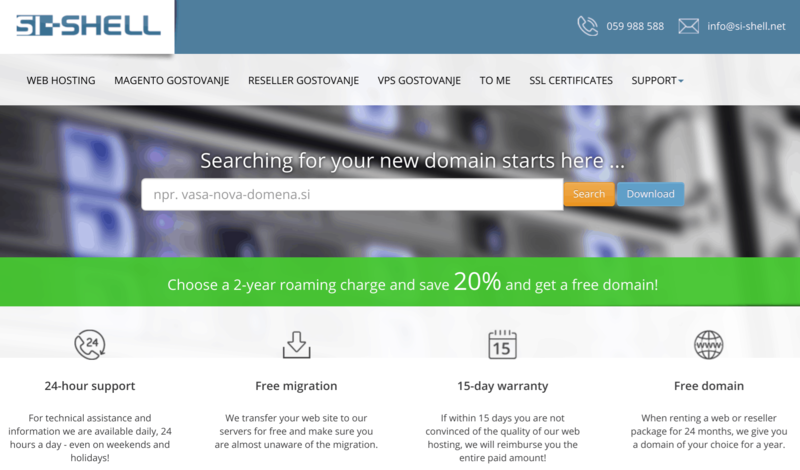 Its excellent customer support combined with custom-made hosting solutions make many webmasters prefer this vendor to other hosting companies in Slovenia and beyond. Wondering how Si-Shell stacks up against other Web Hosting companies? Enter any other Web Hosting company and we will give you a side-by-side comparison.